Join us in Wickenburg, August 9th and 10th for the 12th Annual Rural Policy Forum, brought to you by the Local First Arizona Foundation and the Arizona Rural Development Council. This gathering of rural economic development professionals, nonprofits, community leaders, business owners, tribal communities, and other rural stakeholders who are interested in sustaining rural communities is unlike anything of its kind. 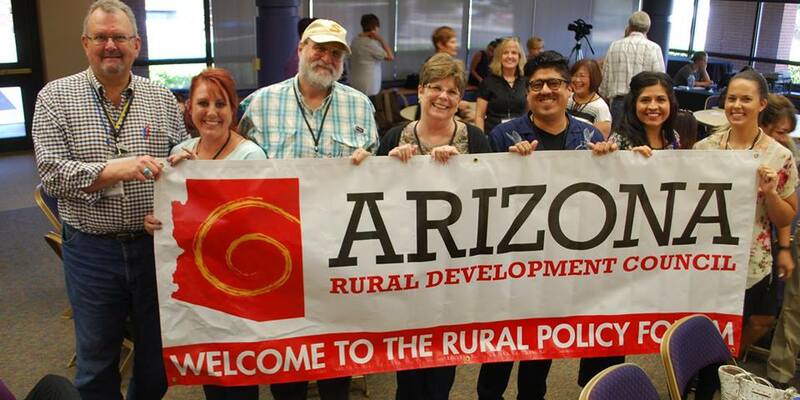 The Rural Policy Forum is an opportunity to hear strategies from national experts as well as learn about success stories from around Arizona that give rural leaders like you the tools, resources and relationships they need to face current challenges. This year we have confirmed two dynamic key note speakers. Charles Marohn, Founder and President of Strong Towns, an organization leading a national movement to fundamentally rethink how cities and towns are built. Marohn will be shining a spotlight on specific approaches that create prosperity and how small, incremental investments in our communities help us grow stronger. Teresa Kittridge, is the Vice President and COO of the Rural Policy Research Institute (RUPRI) and will be addressing the importance and critical need of arts and culture in rural regions. Kitterage will discuss how RUPRI utilizes collective impact investing and how this strengthens economic support systems for rural communities. Complimenting these two speakers, the forum agenda includes interactive panel sessions on topics like Solutions and Barriers to Youth Engagement; Higher Education as a Community Partners; How to Tap Regional Government Support Systems; Early Care and Education Access in Rural Communities; Equity and Workforce Development; How to Harness Backyard Ecotourism; Healthcare as an Economic Driver; and so much more. View the complete agenda, sessions and the expert panelists from across the state on the event page here. Tickets for the 12th Annual Rural Policy Forum are now on sale. We are expecting over 275 people to attend this event. Reserve your spot today so you don't miss this opportunity to connect in a rural community with a diverse group of stakeholders. Join a more intimate group of rural leaders on August 8th from noon to 5:00 pm for a fun and inside look at the economic development of the region. Learn first-hand about industries in Wickenburg that make the region’s economy hum. This is a bus tour with lunch provided. Join us Wednesday evening at 5:30 pm for the opening night celebration and experience the west’s truly most western town! The launch party will be at Desert Caballeros Western Museum and will feature a strolling dinner with cuisine from the region’s best restaurants, live music, and a cash bar. Plenty of opportunities to mix and mingle to get ready for the big day ahead. Be sure to join us for this launch party to get the event started right! Thursday evening from 5:30 to 9:30 p.m., join us for a special dinner with stunning endless views at the Wickenburg Ranch and Social Club, a world-class golf resort and community, with fire pits and plenty of room to breathe. Continue your networking and two-step the night away!